Dubai, UAE, November 06, 2018: Banished to the garden since the 1970s, rattan is taking pride of its place indoors again and are firmly establishing our interiors. As signifiers of a certain type of contemporary style, they are the antithesis of ostentatious and have fast become the homeware of choice in living spaces across the region. 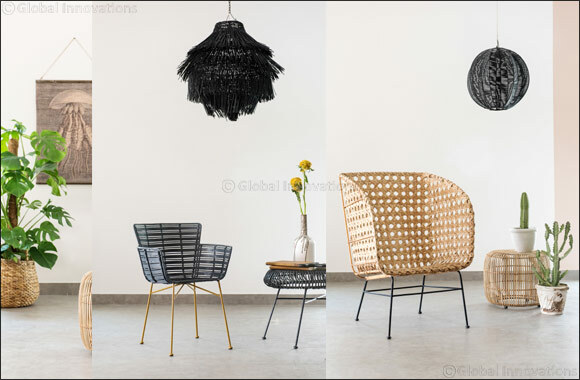 Home and Soul Dubai, the unique lifestyle retail concept store, have introduced a beautiful new rattan collection to their homeware offering: from seats to coffee tables, each item promises to add the perfect relaxed feeling to any home. Rattan is a timeless material and can be placed both indoors and outdoors. It is made from the core of the rattan plant, which grows naturally in tropical climates and can hold up in both humid and high temperatures – ideal for any household in the region. Offering an incredible ability to represent both a summery feeling and a nostalgic, comforting aesthetic, the new Rattan Collection from Home and Soul is sure to suit any interior need this season. The Ibiza Wing Chair has a weightless look as it allows light to travel though, meaning it’s perfect for smaller living spaces. Both practical and sophisticated the Olivia Rattan Stool will add a relaxed feel to any room. Styled with a stack coffee table books on top or simple left alone for that minimal look. Liven up your dining seating with the Barcelona chair. The beautiful grey colour ensures it’s the ideal addition to your table d�cor. The modern oval shape adds instant opulence to a space. The natural colour brings a fresh and authentic feel and can styled with your current homeware items.